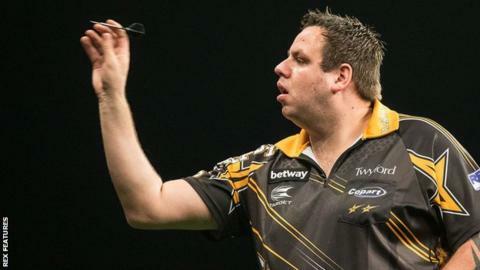 Adrian Lewis claimed the final Premier League play-off place as Dutch favourite Michael van Gerwen clinched top spot in the table in Rotterdam. Double world champion Lewis defeated Gary Anderson 7-2 to take the last top-four spot ahead of Peter Wright. He will face Van Gerwen, who beat Phil Taylor 7-5 to collect a £25,000 league leader's bonus, in the semi-finals. Taylor will play defending champion Anderson in the other last-four tie at London's O2 Arena on 19 May. Van Gerwen's narrow victory over his closest rival Taylor capped a superb evening for the home crowd, as the Netherlands staged a round of Premier League matches for the first time.